Trump offers advice to Boeing on 737: "REBRAND the plane"
ADDIS ABABA/JAKARTA/WASHINGTON (Reuters) – Boeing Co faced growing pressure in Washington on Wednesday as U.S. lawmakers called for executives to testify about two crashed 737 MAX jets while the world’s biggest planemaker worked on returning the grounded fleet to the skies. The Senate hearing, at an unspecified date, would be the first time that a U.S. congressional committee has called Boeing executives to appear for questioning about 737 MAX passenger plane crashes in October in Indonesia and March 10 in Ethiopia. On March 27, the same panel, the Senate Commerce subcommittee on aviation and space, also will question U.S. Federal Aviation Administration (FAA) officials. They will likely be asked why the regulator agreed to certify the MAX planes in March 2017 without requiring extensive additional training. Meanwhile, the FAA on Wednesday sent a notification to global aviation authorities saying the installation of Boeing’s new automatic flight software in the grounded jets and related training was a priority for the agency. 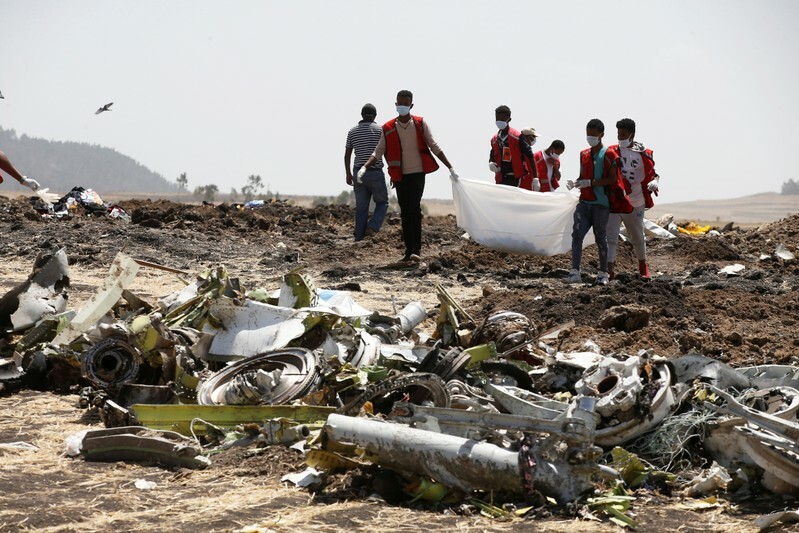 The Ethiopian Airlines crash has shaken the global aviation industry and cast a shadow over the flagship Boeing model intended to be a standard for decades to come, given parallels with the Lion Air calamity off Jakarta in October. The two crashes killed 346 people in all. Boeing was sued on Wednesday in federal court in Chicago by the estate of one of the Lion Air crash victims in which the plaintiffs referred to the Ethiopian crash to support a wrongful death claim against the company. A Boeing spokesman said the company does not respond to, or comment on, questions concerning legal matters. Also on Wednesday, the Seattle Times reported the Federal Bureau of Investigation was joining the investigation into the MAX’s certification. An FBI spokeswoman in Seattle would neither confirm nor deny that it was a part of any investigation. Criminal prosecutors at the U.S. Justice Department, who are also investigating the FAA’s oversight of Boeing, have issued multiple subpoenas to Boeing in an effort to find out more about how the MAX was certified and marketed, CNN reported late on Wednesday, citing sources briefed on the matter. Meanwhile, the Pentagon Inspector General said it would investigate a complaint that Acting U.S. Secretary of Defense Patrick Shanahan, a former Boeing executive, violated ethical rules by allegedly promoting Boeing while in office. Chicago-headquartered Boeing has promised a swift update of software, but regulators in Europe and Canada are shifting away from previous reliance on FAA vetting, saying they will now seek their own guarantees of the MAX planes’ safety. Aviation experts suspect an automated system, meant to stop stalling by dipping the nose, may be involved in both cases, with pilots struggling to override it as their jets plunged downwards. But they stress neither investigation is complete and crew actions and training will also be closely scrutinized. As Ethiopian investigators pored over black box data from their crash, sources with knowledge of the doomed Lion Air cockpit voice recorder revealed how pilots searched a manual to figure out why they were hurtling down to sea. Investigators examining the Indonesian crash want to know how a computer ordered the plane to dive in response to data from a faulty sensor and whether pilots had enough training to respond appropriately. Communications showed that in the final moments, the captain tried in vain to find the right procedure in the handbook, while the first officer was unable to control the plane. At the end, the sources told Reuters, the Indian-born captain, 31, was quiet, while the Indonesian officer, 41, said “Allahu Akbar” (“God is greatest”) – an Arabic phrase to express excitement, shock, praise or distress. The plane then hit water. A different crew on the same plane the previous evening had the same situation but solved it after running through three checklists, though they did not pass on that information to the doomed Indonesian crew, a preliminary report in November said. Regulators want to be absolutely sure of Boeing’s new automated control system, known as MCAS (Maneuvering Characteristics Augmentation System), and that pilots are fully prepared to handle it. MCAS is meant to prevent a loss of lift which can cause an aerodynamic stall and send the plane downwards in an uncontrolled way. Facing high-profile scrutiny, Boeing reshuffled executives in its commercial airplanes unit to focus on its response. The FAA said its “robust processes” and “full collaboration with the aviation community” were key to safety worldwide. As with the Indonesia flight, the Ethiopian crew radioed about control problems shortly after take-off and sought to turn back, struggling to get their plane on track before it hit a field. Ethiopia’s civil aviation head Wosenyeleh Hunegnaw said he expected a report on the investigation within 30 days. For now, more than 350 MAX aircraft are grounded, and deliveries of nearly 5,000 more – worth more than $500 billion – are on hold. Development of the 737 MAX began in 2011 after the launch by its main rival of the Airbus A320neo. The MAX entered service in 2017. While some airlines are worried about the impact on profits, they have been able to keep services going, swapping MAX planes for others, or using partner carriers.